Posted Breed: Boxer / Mixed (medium coat). Adoption Fee: 200. This little guy will win your heart. He is fun loving energetic and full of kisses. He was found wondering the streets by him self with a broken left leg and a broken left foot. He is beginning to heal, but the vet told us that his left leg would be a little shorter and his back foot would always be turned out a little. He lives with other dogs and cats and loves to play. He is potty trained,and crate trained. He loves to snuggle with you, play fetch or just hang out. 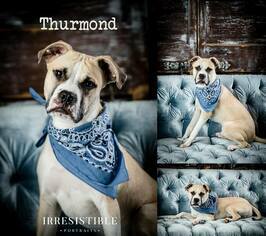 Thurmond is a close talker and has trouble meeting new dogs, we are working on this. If you think this special guy would be a wonderful addition to your family, please fill out an application I promise you he is Mr. personality. Before submitting your application please have ALL veterinarian contact information for all of your current and previous animals that you have had for the past 5 years. Also, if applicable please have all landlord/rental contact information available as you will need it to fill out the application. If all requested information is not completed in its entirety, we will be unable to process your application. If any item is not applicable please put N/A in the cooresponding answer block. Please fill out our online application. If you have questions about the application or adoption process, please click here to read more about it. If you would like to give this dog a &quot;Furever Home&quot; please fill out an online application located under the &quot;Adopt&quot; tab. Please keep in mind that it can take a couple of days for our volunteers to review your application and reply to you. 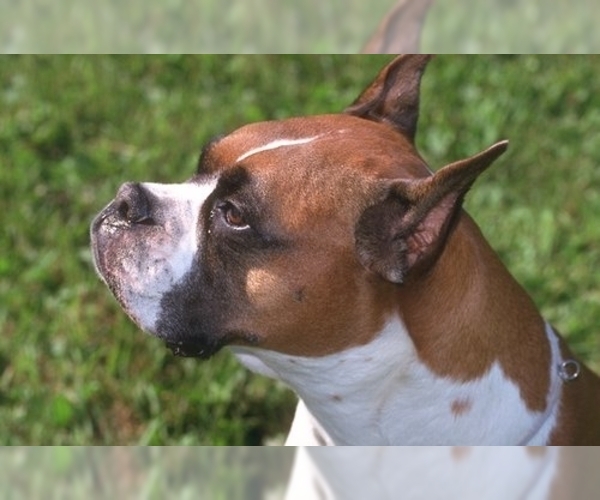 Cabarrus Pets Society reserves the right to perform in-home visits at our discretion. Posted Breed: Boxer / Mixed (short coat). Adoption Fee: 150.00. Posted Breed: Shepherd / Boxer / Mixed (short coat). Posted Breed: Shepherd / Boxer / Mixed. Posted Breed: Boxer / Shepherd / Mixed (short coat). Posted Breed: Black Labrador Retriever / Boxer / Mixed (short coat).